Groups Niho (Trimeriad Cosplay) as Richter; we have yet to wear them all at the same time, but we have Richter, Emil, and Aqua and want to get some photos! Felt and hot glue shape the bottom. Spandex-covered felt is sewn in for the ears. Patterns Made a spandex sloper by tracing an existing dance bodysuit that I'd gotten from Discount Dance. Two major things, one minor: Part of the vinyl got caught and sewn into so there are little punches in it even after the stitches were removed; the seams on the legs don't match up; and I could have shaped the wig a little better at the bottom. Hell, I actually STARTED AND FINISHED it in one week. I'm satisfied with the overall look and my skills at the time. Also, oddly enough, the zipper! In the tips of the fingers, I inserted plastic knives as the points to make my hand look like a fin when it's closed. I also innovated a snap-close design at my wrist so I can remove the cumbersome glove to move around. It's something I use on all my long-gloved cosplays now! I'd love to take my time, make sure the seams line up by basting them in place, and I might try some different prosthetics to make my face look otherworldly! I never made shoes/shoe covers, so I'd want to do that. Also, I want a light-up centurion orb. That would be AWESOME. I'll need to be at tip top shape, but yes, I'd love to wear it again. Now that I know even more about makeup and have more friends cosplaying DotNW, I want pictures! In the whole cast of DotNW, I didn't feel like I fit any of the other characters. Richter was the only one who compelled me, but if Niho made Richter, why not just wear Judith-as-Richter? Much more fun. However, Aqua loves Richter about as much as I do, so I felt it was appropriate for me to follow around a Richter cosplayer. It was also going to be my first makeup challenge. While I didn't go for the completely-flat facial look like I might try later, I'm still happy with it overall! I have three stories for this costume. The first is that I burned my arm pretty badly when I was taking the clay fish bones out of my oven. 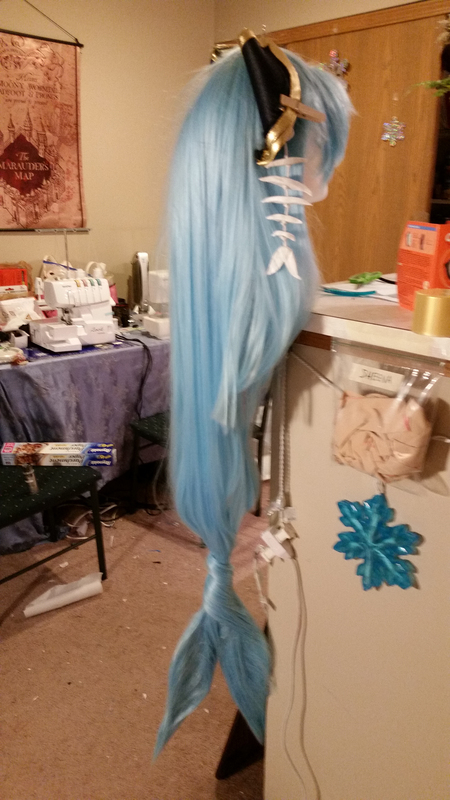 The second is that during the last night of my work on the wig, I accidentally left the hot glue gun on from about 2am until I got home from work at 5pm-ish. (My hot glue gun is, of course, perfectly fine, and still burns me so I never forget my sins.) 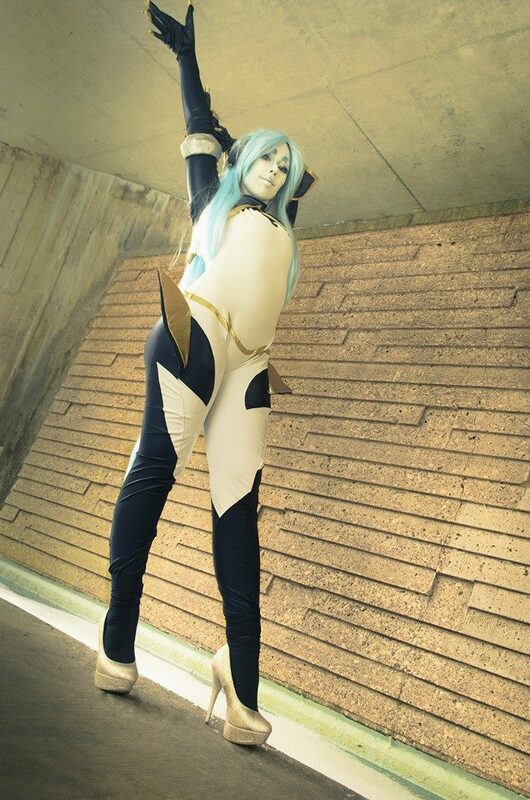 The third is that I decided to make this costume in ONE WEEK, the week before Otakon, which was in July instead of August that year. Between one week starting on a Wednesday and ending the Wednesday morning of when I drove out halfway, I started and finished this thing. I had originally been planning it for Matsuricon in August, but wanted one more costume and decided it was time to bite the bullet for the sake of more, and earlier, photos. I worked late into the night and all over the weekend, getting Trimeriad's help as I dove into this foolish endeavor. The last night of production, I was up hand-sewing until 4am, and I had watched all of the first season of BoJack that night until then. And still got up for work at 7am. Never again, kids! Let this be a lesson! Photos by Lionboogy (Lionel Lum), Silverdrop, Morning Addict Photography, and progress photo by me.